There are a large number of households in North America that rely on satellite service for their Internet connection. Usually this is because they live in remote areas and have limited access to some of the mainstream Internet technologies such as Cable, DSL and Fiber. Advancements in satellite technology have actually provided these households with a fairly decent option for Internet connectivity and speeds have significantly improved over the last decade. However there is still one big question mark with satellite Internet service and one we get asked about frequently - will VoIP work over satellite? The answer, unfortunately, is not straightforward and the best we can respond with is it might! Not the best answer, I know, but it is the truth. In this article we will give a background on satellite Internet service and how it works along with some of the issues that arise with this technology when it comes to VoIP phone service. We will also point you to a great test to run before signing up for VoIP service and provide some satellite Internet provider options that have support for VoIP. Before we delve into some of the reasons why satellite Internet can be problematic for VoIP, it may be good to start with a refresher on satellite based technologies. 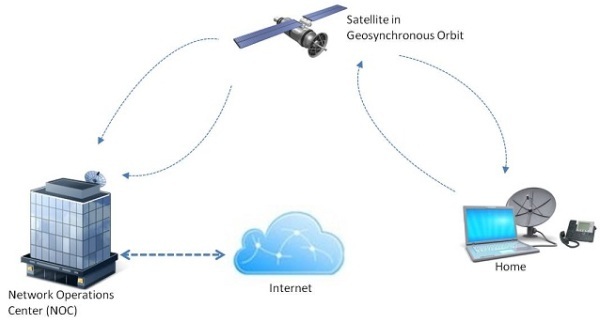 Figure 1 below shows a high level and relatively simplistic view of a satellite system that is used for Internet service. The home or business has a satellite dish installed most likely on the roof or the side of the building. When a web page is requested in a browser, let's assume it is a page on WhichVoIP.com, the request is transmitted to a satellite system that is in a Geosynchronous Orbit (GSO) approximately 22,000 miles above sea level. The GSO at this altitude is such that it matches the Earth's sidereal rotation period which is an important aspect of this system as this ensures that it stays at the same point in the sky with respect to any given point on the Earth. In other words, the satellite system on your roof does not need to move to track the satellite in the sky. This reduces the amount of technology that is required for your satellite system which keeps the price down and of course makes the service much more reliable since once it is calibrated during the installation phase, the signal quality should remain. There are some fluctuations that occur due to solar winds, radiation and gravitationals effects but this is taken care of by the satellite system in the sky, thankfully. The satellite in space relays the web request down to the Network Operation Center (NOC) for the company that is providing you with service. The NOC then handles the data request across the Internet to our web servers at WhichVoIP.com and we relay the content back to the NOC. The NOC then sends this data back to the orbiting satellite which relays the information to the dish on your roof and then to your browser. This is of course simplified but in essence it is how traffic flows through a satellite system. The main reason for this article is to discuss the issues that can arise when running VoIP over a satellite Internet service. An assumption that is made in this article is that the reader has an understanding of what VoIP actually is. In simple terms it is your voice being sent as small digital packets across the Internet but for a more complete explanation please see our Advanced VoIP Guide. Bandwidth: Bandwidth is the amount of data that can be sent in a given time period. A VoIP call with minimal compression requires a bandwidth of at least 100Kb/s. If this is not guaranteed at all times then quality will suffer. Latency: This is a measure of the time taken for a voice packet to reach its destination. The return path is just as important and will not necessarily be the same delay since we are dealing with the Internet, a place where packets can make many different server hops to get to its destination. When latency is too long it becomes very noticeable to both parties. This is not necessarily a quality issue, though it can be if echoes are also present, but leads to a poor conversation as often both parties interrupt each other. The International Telecommunications Union (ITU) recommends a maximum one way latency of 400 milliseconds (ms). See the additional resources section below to gain access to this document. Jitter: Related to latency but is a measure of the variance in latency between packets. In an ideal world the jitter would be zero. In other words a packet always takes the same length of time to travel to its destination. When jitter is large it exasperates the problems associated with latency as it is not consistent. Packet Loss: When you access the web, the underlying protocol is called the Transmission Control Protocol (TCP). This is a very robust protocol and when a packet is lost on the Internet, something that happens frequently by the way, it is known because no acknowledgement was made for the packet so it can be automatically resent. VoIP traffic is sent using a protocol known as the User Datagram Protocol (UDP) which has no such acknowledgement and packets are not resent. When packets are lost they remain lost and depending on the number of lost packets this can show itself as broken conversations. Packet Order and Discards: This is related to jitter in that jitter can cause packets to arrive out of order. Obviously this cannot be tolerated as otherwise the conversation will be out of order so packets get backed up to keep them in order. If the resulting delays become intolerable, packets get discarded leading to audio that breaks up. MOS Score: This is a parameter used by the VoIP industry to determine voice quality. It is subjective but an important element of VoIP. A score of five would be similar to talking face-to-face and a score of one would be unusable. Our VoIP test, as you will see, can predict what your MOS score quality will be so it is worth running this test if you have a satellite Internet connection before signing up for VoIP service. Now that we have an understanding of how satellite Internet works and the factors that affect VoIP audio quality it is time to address some of the issues that can occur when VoIP is passed over satellite Internet. In addition, potential solutions to each problem are highlighted. Issue: Depending on the Codec used, VoIP requires a minimum bandwidth for the call in both directions (uplink and downlink), this is often as high as 100Kb/s. Some satellite services have poor bandwidth in one direction which can affect the quality of the call. Solution: Some providers have newer technology and modulation schemes so can offer higher bandwidth. Also some providers will include Committed Information Rates (CIR) to guarantee there is enough bandwidth available for voice traffic. Issue: The time taken for data sent from your dish to the satellite in space and then down to the NOC is approximately 500ms. This does not include the time for the servers in the NOC to process the request and send it across the Internet to its destination. So there is always a minimum of 500ms additional delay when dealing with a satellite connection. 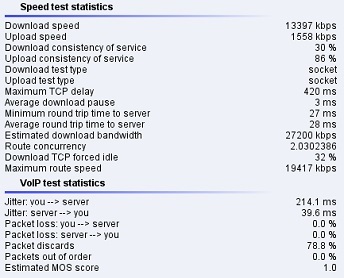 This additional latency can cause problems with VoIP as detailed in the previous section. Solution: There is nothing that can be done to change the transmission time through space, it is a function of distance and the speed of light. However ensuring that the turn-around time at the NOC servers is kept to a minimum can help here. Some satellite providers can keep the total latency as low as 600ms which is still higher than that recommended by the ITU. Issue: There are a number of variables that can impact the reliability of a satellite signal and this can result in packet loss and errors. VoIP relies on a reliable Internet connection and because it is based on UDP no packet retries occur meaning a bad packet stays bad which can break up a conversation. Solution: Ensure that bit errors in the transmission are very low. Some providers have the technology to guarantee bit errors as low as 1 bit in 1,000,000,000 bits. That is very small and ensures minimal packet errors. Issue: Voice packets must be in the correct order, for obvious reasons. If packets get backed up due to poor jitter performance they can be discarded resulting in drops in a conversation. Solution: Satellite providers employing Time Division Multiple Access (TDMA) schemes can ensure that packets are arranged as timeslots and therefore arrive in order. This is similar to a GSM cellular system. Also jitter buffers can be introduced to buffer the packets up in order. The only expense here is additional latency. To try and highlight an example of the problems discussed above, see Figures 2 and 3 below which show important test result parameters over a Fiber Optic service (FiOS) and Hughes Gen4 satellite Internet service, respectively. Figure 3 was kindly provided to us by one of our visitors (thank you Jim) on October 2013. 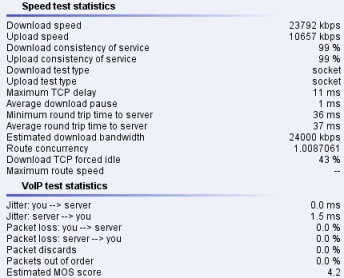 Compare the maximum TCP delay parameter which indicates the maximum time a client was forced to wait for data. Also the jitter, packet discards and MOS score suggests to us that VoIP would have real problems over this connection. We would love to hear from you if you have satellite Internet so we can add more test result samples to this article. All we need is for you to run our VoIP and speed test using your satellite Internet service and then view the advanced results. Please contact us using our comment form below to interact with our team and we will add your results to this article. There are a few satellite providers that have introduced technology and features such as that highlighted in Table 1 above and therefore indicate support for VoIP on their websites. Often these providers push their own VoIP service which can be expensive and have a limited feature set so we recommend also looking at the VoIP providers you see on our website as part of your research as it may well save you a lot of money. For example we have providers listed on our site that are as low as $5.99/month for unlimited calls. As to whether a third party provider of VoIP will work, in our opinion it has as much chance as the satellite providers phone plan. One option would be to start with the satellite phone plan and try out a third party provider in your own time. If it does not work, cancel the third party service, they usually have a 30-day money back guarantee. If it does work, great you can cancel the satellite phone plan and save money. However based on the limited test results above, it would seem unlikely that a VoIP call would be successful. Over time we hope to obtain more results and experiences from our visitors which may provide higher confidence levels. Some of the satellite providers supporting VoIP are highlighted in Table 2 below but if you know of others or have feedback on any of the providers listed please let us know using the comments section on this page. For information regarding the Internet service costs refer to our Guide to Satellite Internet service. * See our business and residential sections for 3rd party VoIP offerings that are lower cost. You will likely now have an appreciation of how satellite Internet service actually works and some of the issues that affect VoIP based phone calls over this medium. However there have been technological advancements over the last 10 years and some providers are now offering VoIP plans as add-ons to satellite service. Some of these providers have been highlighted and they often have their own phone plans that they are selling which tend to cost significantly more than third party VoIP service. In reality, if they promote their own VoIP plan then they must have confidence that their Internet service can support VoIP so really a third party VoIP service should also work. However based on the limited results we have seen, the quality of those calls is still in question. As always, do your own due diligence on the best path to take for your needs and please help other visitors by providing feedback in our comments section below. ITU - One way transmission time analysis for phone calls. Wikipedia - Satellite Internet signal latency. WhichVoIP Satellite Internet Reviews - Reviews for ISPs including satellite providers. 1. VoIP is not a reliable way of contacting 911 or allowing the 911 operator to geolocate me if I am unable to communicate my location. 2. I have frequent power outages. No power, no internet, no VoIP. 3. My landline bill is only $2.50/month greater than Exede's or Hughesnet VoIp plan. Conclusion: more downside than upside. Got HughesNet satellite internet installed a month ago in my camp at a location off the grid. Had professional install and works well for internet. Purchased the best data plan that was available (50gb per month, etc). Had an Ooma VOIP box that I used with good results in another application at home a couple years ago and decided to hook it up at camp to the satellite connection. Was very disappointed. One end of the connection was always garbled, out of order, etc, making it 100% unusable. Sometimes the person I called said they could hear me fine but I couldn't understand them. Other times I could hear them fine but they couldn't understand me. Called home and left myself a message and played it back at home and it was totally scrambled up. Was thinking the HughesNet Gen4 system might have better results but after reading info here I have my doubts. And it's also fairly expensive. Unfortunately with no cell service at the location it might be an only option. Would love to see someone's results with it if they've got it. -> Response: Do you have a router in your network at the camp? If so do you know the make and model? You want to turn off a setting called SIP ALG if there is one and it is enabled (tends to be). That can cause all sorts of audio issues. Ooma may be able to change the jitter buffer settings so you can handle the additional jitter and latency that occurs with satellite feeds. Also when testing the VoIP make sure nothing else is using the Internet at that time, just for completeness. You could also try connecting the Ooma directly into the satellite modem rather than through a router (if you are using a router). Just a few things worth trying to see if we can get something that has acceptable audio. If your VoIP test results remain the same, I really don't think you have much chance of success here I am sorry to say Joel. I ran the VoIP test and got: download 14.9mbps, upload speed 4.52mbps, consistency of service 39%, Jitter 9.6ms, packet loss 0.0%, MOS score estmated to be 4.0 Can you tell me if Excede VoIP will work for me? I dont understand all these numbers and what they mean. Just checking on VoIP possibilities. -> Response: Your results aren't too bad but the jitter and consistency are a little concerning. VoIP can be questionable with satellite Internet service as per this article, so it is tough to know for sure how you will do without trying it. If you are game for trying it, pick a provider but do not port/transfer any existing number over yet though. Instead, just get a new number and try the service out. Most providers have a 30 day return policy (check when you sign up). If the service is poor when you test it just return for a refund. If happy with the service get the provider to port over any existing landline numbers you may have so you keep your phone number. Had DSL service from Century Link. They could only offer 1.5mbps to me due to my distance from the Central Office. Fell for the ViaSat pitch who offered up to 10mbps (yea right) and I ended up being less happy with the HSI from ViaSat than the DSL from Century Link. I also piggybacked the Exede voip on the satellite system. The delays and the echos are too much for me. Before I had Vonage voip on the dsl and I was not unhappy but thought I could improve with the satellite HSI. I am in the process of cancelling the services, paying the early term fees and returning to what works best for me. My experience with Exede customer service is deplorable. The people are courteous and a pleasure to talk to and most keep their cool however the hold time to get from one extention to another is unreal. They also close their call technical department and are told to call back after 7:00 AM cst which is 9:00 Am est. Thanks for the opportunity to vent my spleen to the world. I am in a rural area and have satellite broadband service. This service has a data cap of 10Gb per month and then extra charges apply. I ran the VoIP test tool on this site and everything looks good, but how do I determine the impact of VoIP on the data cap? -> Response: A good way to estimate this is to determine the bit rate for VoIP. Typically this is around 100kb/s uplink and downlink depending on the Codec that is used for compressing your voice. So for example assuming no other data usage other than VoIP this would be over 27 hours of talk time per month to fill the 10Gbits. As you can tell by the email address I have Hughes for satellite internet service. My MOS score was 1.0 but the jitter was 214.1 for me to the server and 39.1 server to me. I am on the latest Gen4 system that Hughes offers and they are now offering VOIP service. Has anyone tried it yet? -> Response: Good question Jim and thanks for sending your results over, we added it to the article! The results are quite bad in all honesty so we have some concern about the quality of a VoIP call over this satellite connection. Appreciate your willingness to help our community.